Download "23 Credit Control and Debt Management"
2 23 Credit Control and Debt Management 23.1 Introduction Income from various sources is collected differently and the University Credit Control and Debt Management policy should reflect this. A Credit Control and Debt Management Policy is vital to prevent unauthorised risks being taken with the University s resources. International opportunities have provided an area of expansion for the University over the last few years. It is important that staff are aware of and capable of managing the risk associated with trading in overseas markets. Effective credit control maximises the cash flows from each area of the business and minimises the risk to the University of bad debt. It is vital that all decision makers in the organisation are aware of the importance of credit control and debt management and fully co-operate with Financial Services staff managing the administrative process. Financial Services in return will provide assistance and advice to other departments on credit control and debt management issues. 3 23.2 Scope of this Policy This policy applies to all past, present and future students of the University and all contract arrangements, customers and trade debtors of the University, or person(s) or organisation(s) that become indebted to the University General Information Payment Methods The following payment methods are available*: Cash Cheque Money Orders Bank Transfer (Telegraphic Transfer /Bpay /AustPost BillPay) Credit Card Debit Card International Bank Drafts *The full range of payment methods may not be available to all debtors Refund Methods The following refund methods will apply to payments received: 1) Credit card payments made directly to USQ will be refunded back to the originating credit card. 2) Cash, cheques, money orders, Debit Cards, Bpay and AustPost BillPay, bank transfers and International Bank Drafts will be refunded via Australian Cheque, EFT, International Bank Draft or International Bank transfer as appropriate. 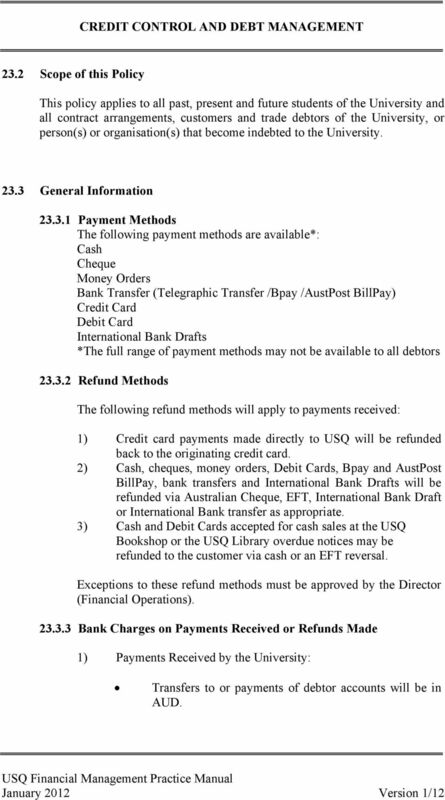 3) Cash and Debit Cards accepted for cash sales at the USQ Bookshop or the USQ Library overdue notices may be refunded to the customer via cash or an EFT reversal. Exceptions to these refund methods must be approved by the Director (Financial Operations) Bank Charges on Payments Received or Refunds Made 1) Payments Received by the University: Transfers to or payments of debtor accounts will be in AUD. 4 In exceptional circumstances and only under contract, transfers or payments may be made in a currency that is immediately available and convertible without loss of exchange to USQ. 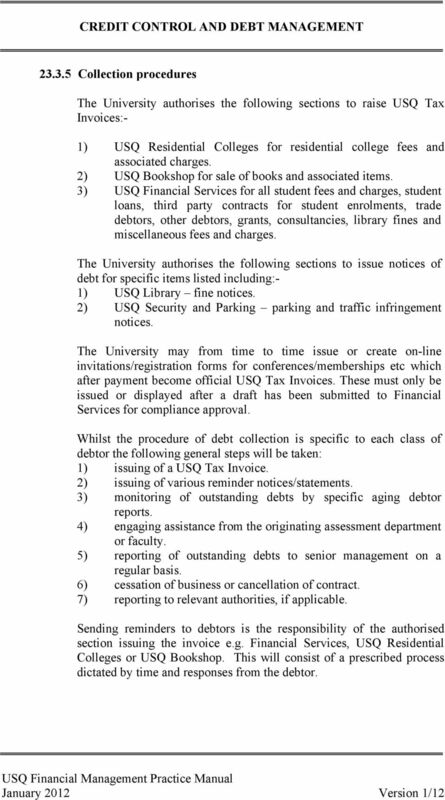 The USQ debtor must carry all bank charges or deductions imposed by the originating banker relating to the transfer or payment of monies to USQ. The University will carry all bank charges or deductions arising from the actions of the bankers to whom USQ requests any amounts to be paid. 2) Refunds Made by the University: All credit card refunds will be in AUD. All other transfers or payments of refunds will normally be in AUD. In some circumstances a USQ debtor may request a refund in a currency other than AUD. Refer to the section on REFUNDS in this Policy. The University will carry all bank charges or deductions imposed by the actions of the bankers to whom USQ engages to make the payment or transfer including the University s nominated supplier of foreign currency. 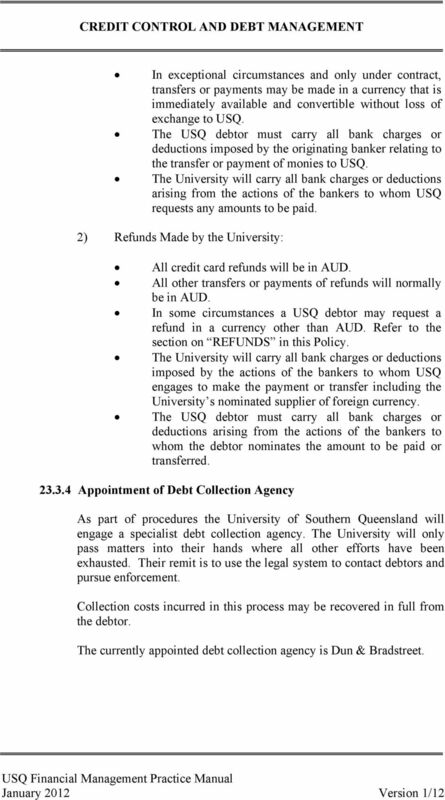 The USQ debtor must carry all bank charges or deductions arising from the actions of the bankers to whom the debtor nominates the amount to be paid or transferred Appointment of Debt Collection Agency As part of procedures the University of Southern Queensland will engage a specialist debt collection agency. The University will only pass matters into their hands where all other efforts have been exhausted. Their remit is to use the legal system to contact debtors and pursue enforcement. Collection costs incurred in this process may be recovered in full from the debtor. The currently appointed debt collection agency is Dun & Bradstreet. 5 Collection procedures The University authorises the following sections to raise USQ Tax Invoices:- 1) USQ Residential Colleges for residential college fees and associated charges. 2) USQ Bookshop for sale of books and associated items. 3) USQ Financial Services for all student fees and charges, student loans, third party contracts for student enrolments, trade debtors, other debtors, grants, consultancies, library fines and miscellaneous fees and charges. 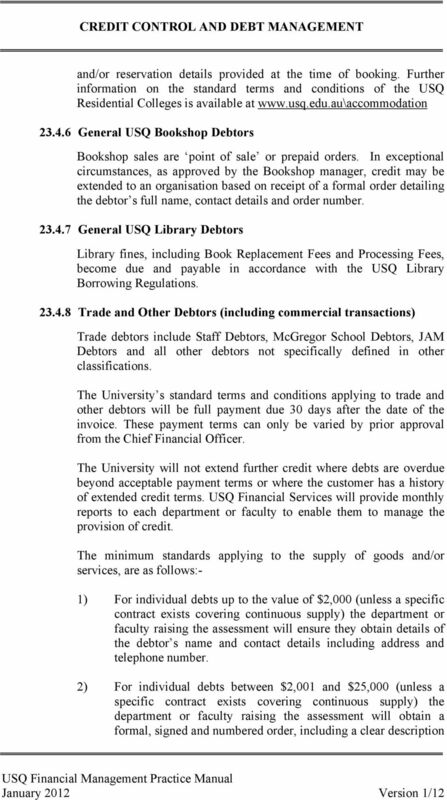 The University authorises the following sections to issue notices of debt for specific items listed including:- 1) USQ Library fine notices. 2) USQ Security and Parking parking and traffic infringement notices. The University may from time to time issue or create on-line invitations/registration forms for conferences/memberships etc which after payment become official USQ Tax Invoices. These must only be issued or displayed after a draft has been submitted to Financial Services for compliance approval. Whilst the procedure of debt collection is specific to each class of debtor the following general steps will be taken: 1) issuing of a USQ Tax Invoice. 2) issuing of various reminder notices/statements. 3) monitoring of outstanding debts by specific aging debtor reports. 4) engaging assistance from the originating assessment department or faculty. 5) reporting of outstanding debts to senior management on a regular basis. 6) cessation of business or cancellation of contract. 7) reporting to relevant authorities, if applicable. Sending reminders to debtors is the responsibility of the authorised section issuing the invoice e.g. Financial Services, USQ Residential Colleges or USQ Bookshop. This will consist of a prescribed process dictated by time and responses from the debtor. 6 Debt Write-Off After all avenues of debt collection have been exhausted or it is established that it would not be economically viable to pursue a debt, the Chief Financial Officer holds the financial delegation to write-off the debt. The writing-off of a debt does not constitute a satisfactory settlement of the debt. 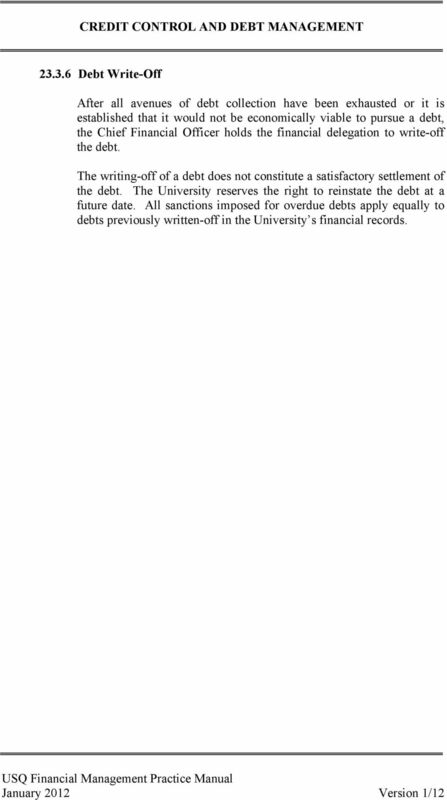 The University reserves the right to reinstate the debt at a future date. All sanctions imposed for overdue debts apply equally to debts previously written-off in the University s financial records. 8 International, may be issued with their Confirmation of Enrolment (ecoe) after payment of a nominated deposit amount. As a minimum this deposit should be not less than the student s program length Overseas Health Cover. Students admitted via a preferred recruitment process are required to pay a deposit equal to their estimated first semester of tuition fees and program length Overseas Health Cover, prior to their arrival in Australia. USQ International will develop and maintain procedures that ensure these minimum standards of credit control are achieved for International Students studying in their first semester oncampus at USQ. Where the deposit paid, based on the estimated first semester of tuition fees, is less than the fees calculated on the final course enrolments for that semester, the balance of fees will become due and payable on the date published by the University as the due date for payment of fees. The University from time to time, may limit the credit offered to groups of students from various countries or regions where, due to economic or political reasons, there is reasonable belief that the student cannot meet their financial obligation to the University within acceptable terms. 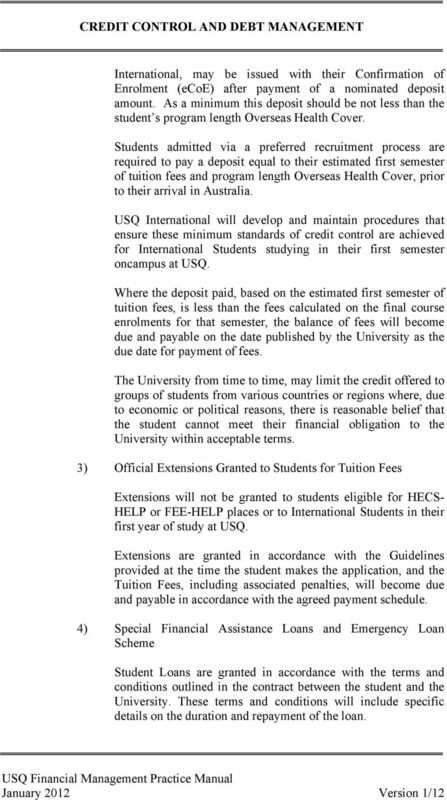 3) Official Extensions Granted to Students for Tuition Fees Extensions will not be granted to students eligible for HECS- HELP or FEE-HELP places or to International Students in their first year of study at USQ. Extensions are granted in accordance with the Guidelines provided at the time the student makes the application, and the Tuition Fees, including associated penalties, will become due and payable in accordance with the agreed payment schedule. 4) Special Financial Assistance Loans and Emergency Loan Scheme Student Loans are granted in accordance with the terms and conditions outlined in the contract between the student and the University. These terms and conditions will include specific details on the duration and repayment of the loan. 9 5) Library Fines Library fines, including Book Replacement Fees and Processing Fees, become due and payable in accordance with the USQ Library Borrowing Regulations. 6) Miscellaneous student fees and charges Miscellaneous fees and charges include, but are not limited to, Graduation Fees, Orientation Fees, Transcript Fees and Graduation Gown Hire. These fees and charges become due and payable at point of sale via the University Cashier in Financial Services. 7) USQ Student Residential College Fees Students are accepted into the USQ Residential Colleges in accordance with the Rules of Residency available at 8) USQ Bookshop Student Sales Bookshop sales to students are point of sale or prepaid orders. Credit will not be extended to students for book sales. 9) Student Overseas Health Cover The University will establish an agency arrangement with a nominated health provider to enable the University to collect and remit OSHC payments on behalf of individual students. The University will not give credit to individual students for OSHC. The current contracted health provider is WorldCare Sponsors and Employee Sponsors Sponsors and Employee Sponsors include third party organisations located either in Australia or overseas, who have formally contracted with the University to accept debts on behalf of Individual Students. At a minimum these contracts will address the following issues:- 1) The legal name of the Sponsor. 2) The postal address of the Sponsor. 3) A contact person for the sponsor including phone number. 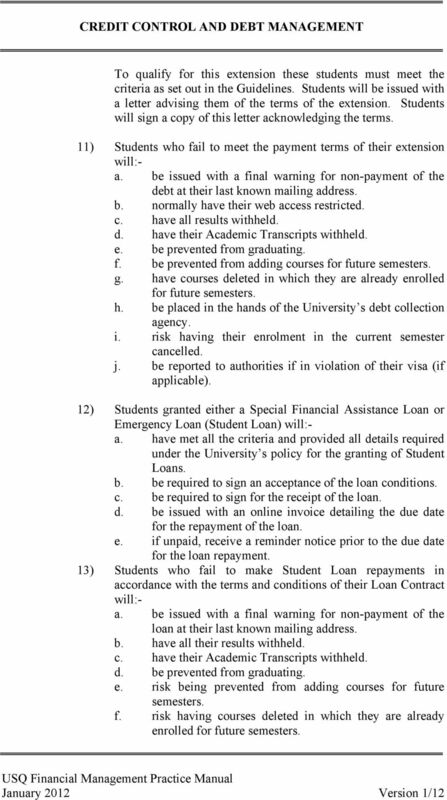 4) Full terms and conditions of the acceptance of the debt including the details of the charges to be factored e.g. Tuition Fees, OSHC, Gown Hire. 12 of the goods and/or services to be provided, the debtor s name and contact details including address and telephone number. 3) For individual debts between the value of $25,001 and $100,000 the department or faculty will initiate the signing of a contract between the University and the debtor before goods and/or services are supplied. For new debtors, the department or faculty will contact the Director (Financial Operations) in Financial Services to obtain a Dun & Bradstreet credit check prior to finalisation of the contract. This contract will be executed in accordance with the USQ Legal Office contract procedures. 4) For individual debts over $100,001 the department or faculty will initiate the signing of a contract between the University and the debtor before goods and /or services are supplied. For new debtors, the department or faculty will contact the Director (Financial Operations) in USQ Financial Services to obtain a Dun & Bradstreet credit check. Depending on the goods and/or services to be provided the University may also require copies of the last two years of the organisation s financial statements and a business plan, where the contract includes milestones, prior to finalisation of the contract. 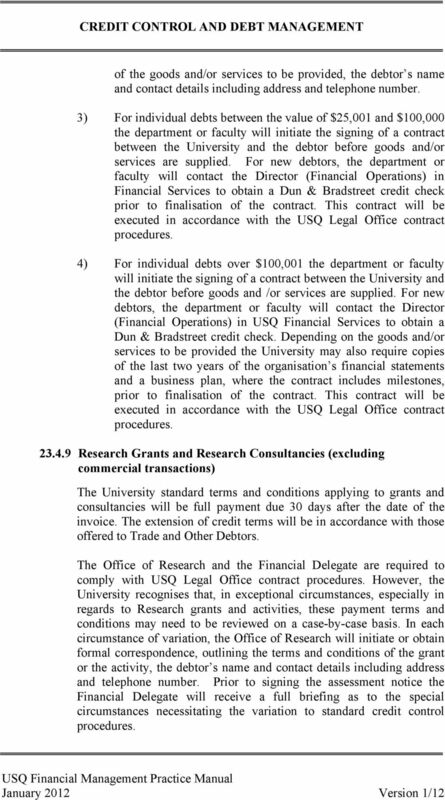 This contract will be executed in accordance with the USQ Legal Office contract procedures Research Grants and Research Consultancies (excluding commercial transactions) The University standard terms and conditions applying to grants and consultancies will be full payment due 30 days after the date of the invoice. The extension of credit terms will be in accordance with those offered to Trade and Other Debtors. The Office of Research and the Financial Delegate are required to comply with USQ Legal Office contract procedures. However, the University recognises that, in exceptional circumstances, especially in regards to Research grants and activities, these payment terms and conditions may need to be reviewed on a case-by-case basis. In each circumstance of variation, the Office of Research will initiate or obtain formal correspondence, outlining the terms and conditions of the grant or the activity, the debtor s name and contact details including address and telephone number. Prior to signing the assessment notice the Financial Delegate will receive a full briefing as to the special circumstances necessitating the variation to standard credit control procedures. 14 due date will have their Web access restricted until payment is received or Census date. 6) Domestic tuition students who are eligible for FEE-HELP but fail to request FEE-HELP, and who fail to make full payment of their tuition fees by the due date will have their Web access restricted until payment is received or Census date. 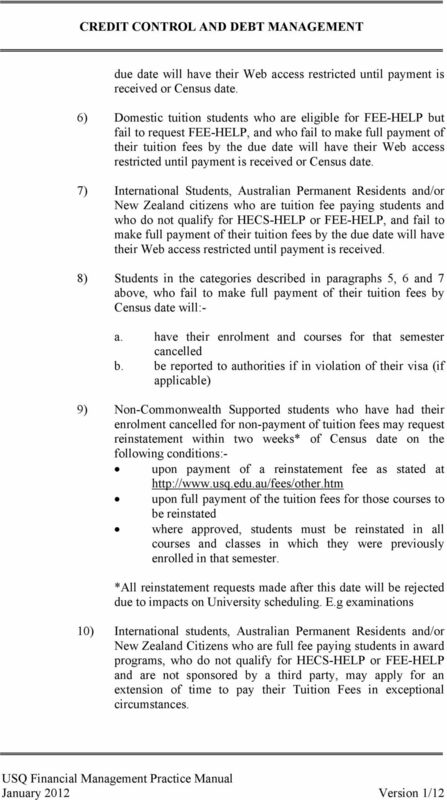 7) International Students, Australian Permanent Residents and/or New Zealand citizens who are tuition fee paying students and who do not qualify for HECS-HELP or FEE-HELP, and fail to make full payment of their tuition fees by the due date will have their Web access restricted until payment is received. 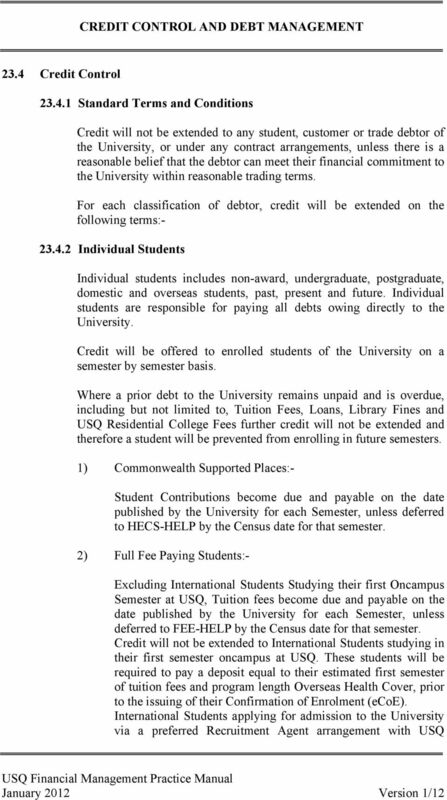 8) Students in the categories described in paragraphs 5, 6 and 7 above, who fail to make full payment of their tuition fees by Census date will:- a. have their enrolment and courses for that semester cancelled b. be reported to authorities if in violation of their visa (if applicable) 9) Non-Commonwealth Supported students who have had their enrolment cancelled for non-payment of tuition fees may request reinstatement within two weeks* of Census date on the following conditions:- upon payment of a reinstatement fee as stated at upon full payment of the tuition fees for those courses to be reinstated where approved, students must be reinstated in all courses and classes in which they were previously enrolled in that semester. *All reinstatement requests made after this date will be rejected due to impacts on University scheduling. E.g examinations 10) International students, Australian Permanent Residents and/or New Zealand Citizens who are full fee paying students in award programs, who do not qualify for HECS-HELP or FEE-HELP and are not sponsored by a third party, may apply for an extension of time to pay their Tuition Fees in exceptional circumstances. 15 To qualify for this extension these students must meet the criteria as set out in the Guidelines. Students will be issued with a letter advising them of the terms of the extension. Students will sign a copy of this letter acknowledging the terms. 11) Students who fail to meet the payment terms of their extension will:- a. be issued with a final warning for non-payment of the debt at their last known mailing address. b. normally have their web access restricted. c. have all results withheld. d. have their Academic Transcripts withheld. e. be prevented from graduating. f. be prevented from adding courses for future semesters. g. have courses deleted in which they are already enrolled for future semesters. h. be placed in the hands of the University s debt collection agency. i. risk having their enrolment in the current semester cancelled. j. be reported to authorities if in violation of their visa (if applicable). 12) Students granted either a Special Financial Assistance Loan or Emergency Loan (Student Loan) will:- a. have met all the criteria and provided all details required under the University s policy for the granting of Student Loans. b. be required to sign an acceptance of the loan conditions. c. be required to sign for the receipt of the loan. d. be issued with an online invoice detailing the due date for the repayment of the loan. e. if unpaid, receive a reminder notice prior to the due date for the loan repayment. 13) Students who fail to make Student Loan repayments in accordance with the terms and conditions of their Loan Contract will:- a. be issued with a final warning for non-payment of the loan at their last known mailing address. b. have all their results withheld. c. have their Academic Transcripts withheld. d. be prevented from graduating. e. risk being prevented from adding courses for future semesters. f. risk having courses deleted in which they are already enrolled for future semesters. 16 g. be placed in the hands of the University s debt collection agency. 14) Students who receive a Library Fine, Book Replacement Fee and/or Processing Fee for late return or non-return of Library Books will:- a. have their borrowing rights suspended in accordance with The USQ Library Borrowing Regulations. b. be issued with an overdue notice at their last known mailing address c. be issued with an online invoice detailing the fines and fees imposed with a final due date for payment. d. if unpaid, receive a reminder notice/final warning at their last known mailing address. 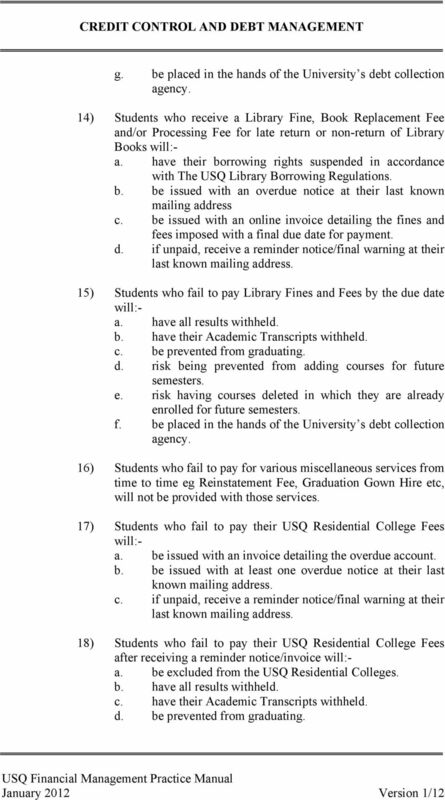 15) Students who fail to pay Library Fines and Fees by the due date will:- a. have all results withheld. b. have their Academic Transcripts withheld. c. be prevented from graduating. d. risk being prevented from adding courses for future semesters. e. risk having courses deleted in which they are already enrolled for future semesters. f. be placed in the hands of the University s debt collection agency. 16) Students who fail to pay for various miscellaneous services from time to time eg Reinstatement Fee, Graduation Gown Hire etc, will not be provided with those services. 17) Students who fail to pay their USQ Residential College Fees will:- a. be issued with an invoice detailing the overdue account. b. be issued with at least one overdue notice at their last known mailing address. c. if unpaid, receive a reminder notice/final warning at their last known mailing address. 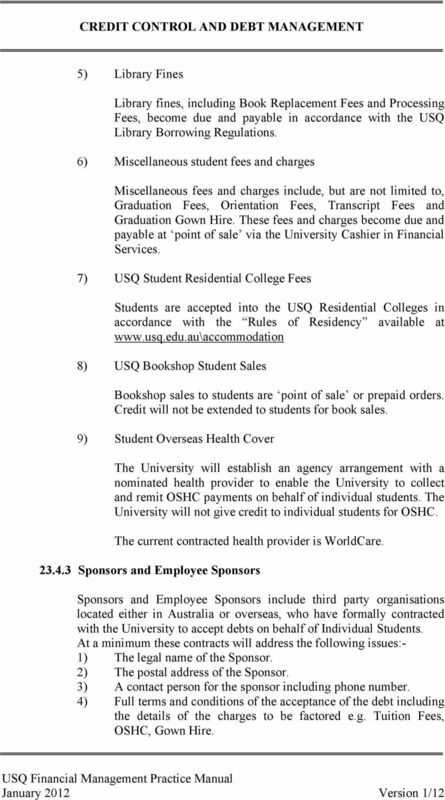 18) Students who fail to pay their USQ Residential College Fees after receiving a reminder notice/invoice will:- a. be excluded from the USQ Residential Colleges. b. have all results withheld. c. have their Academic Transcripts withheld. d. be prevented from graduating. 17 e. risk being prevented from adding courses for future semesters. f. risk having courses deleted in which they are already enrolled for future semesters. g. be placed in the hands of the University s debt collection agency. 19) Students who fail to pay for costs incurred by the University or charges imposed by the University, including but not limited to, dishonoured cheques, damages to University property or costs incurred due to the actions of the student will:- a. have all results withheld. b. have their Academic Transcripts withheld. c. be prevented from graduating. d. risk being prevented from adding courses for future semesters. e. risk having courses deleted in which they are already enrolled for future semesters. f. be placed in the hands of the University s debt collection agency Agents, Partners, Sponsors and Employee Sponsors Agents, Partners, Sponsors and Employee Sponsors will receive invoices in accordance with the terms of their contract with the University. As a minimum this will be one invoice after the majority of students have been enrolled for that semester with a reminder or followup invoice after census date once enrolments are confirmed and if the account remains unpaid. 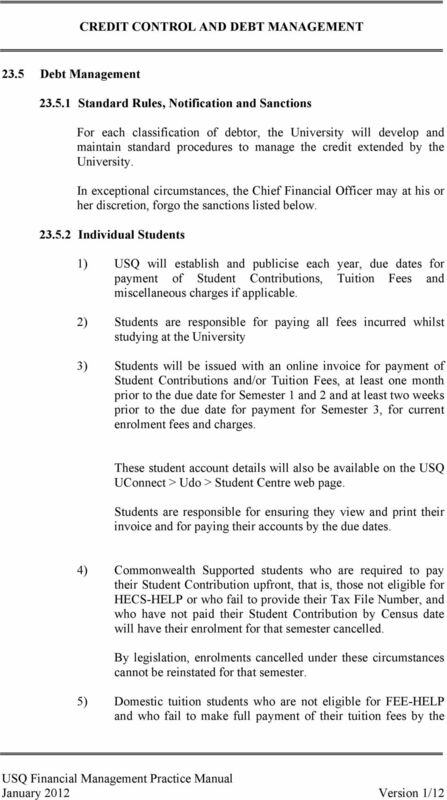 Should a Sponsor or Employee Sponsor fail to make payment of fees on behalf of a student then the University reserves the right to apply sanctions against that student in accordance with rules relating to Individual Students as detailed in point 5) above. 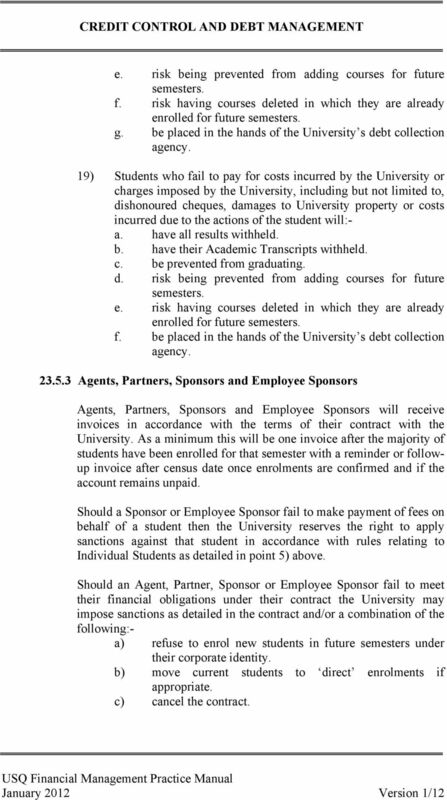 Should an Agent, Partner, Sponsor or Employee Sponsor fail to meet their financial obligations under their contract the University may impose sanctions as detailed in the contract and/or a combination of the following:- a) refuse to enrol new students in future semesters under their corporate identity. b) move current students to direct enrolments if appropriate. c) cancel the contract. 18 d) place the debt in the hands of the University s debt collection agency or engage legal representation as required General USQ Residential College Debtors General USQ Residential College Debtors will receive at least one invoice for unpaid fees at their last known mailing address. Organisations or members of the general public who fail to pay their USQ Residential College fees by the due date will:- a) be issued with a reminder invoice for the debt. b) be prevented from residing at or receiving related services at the USQ Residential Colleges. c) be placed in the hands of the University s debt collection agency General USQ Bookshop Debtors General USQ Bookshop Debtors will receive at least one invoice at their last known mailing address. 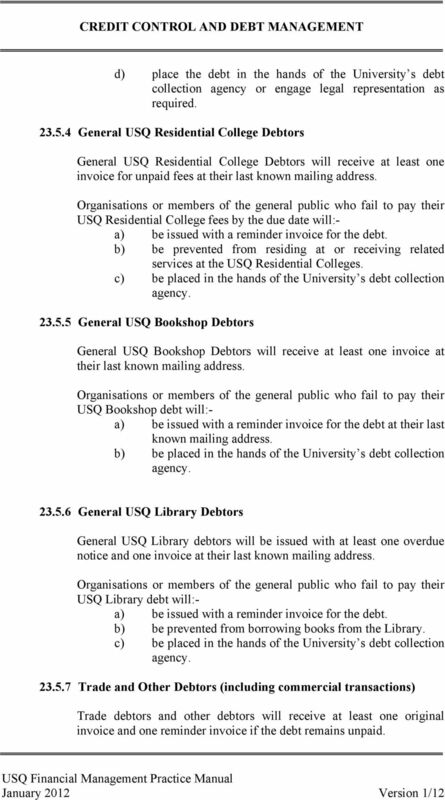 Organisations or members of the general public who fail to pay their USQ Bookshop debt will:- a) be issued with a reminder invoice for the debt at their last known mailing address. b) be placed in the hands of the University s debt collection agency General USQ Library Debtors General USQ Library debtors will be issued with at least one overdue notice and one invoice at their last known mailing address. Organisations or members of the general public who fail to pay their USQ Library debt will:- a) be issued with a reminder invoice for the debt. b) be prevented from borrowing books from the Library. c) be placed in the hands of the University s debt collection agency Trade and Other Debtors (including commercial transactions) Trade debtors and other debtors will receive at least one original invoice and one reminder invoice if the debt remains unpaid. 19 Where the debt continues to remain unpaid, Financial Services will contact the issuing department or faculty to engage assistance with the debt collection process. 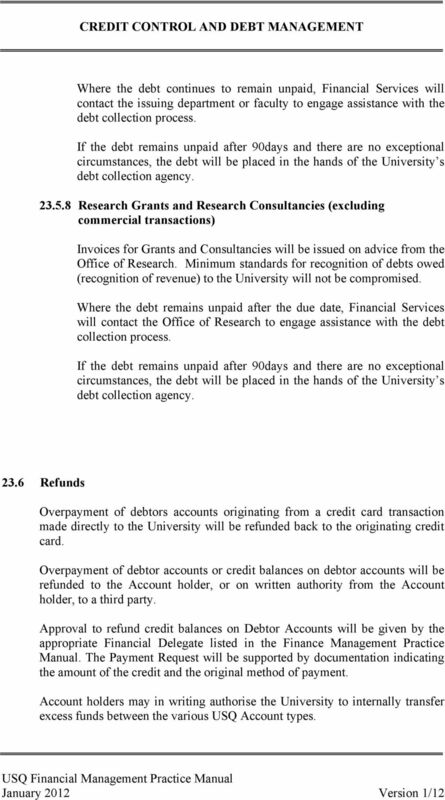 If the debt remains unpaid after 90days and there are no exceptional circumstances, the debt will be placed in the hands of the University s debt collection agency Research Grants and Research Consultancies (excluding commercial transactions) Invoices for Grants and Consultancies will be issued on advice from the Office of Research. Minimum standards for recognition of debts owed (recognition of revenue) to the University will not be compromised. Where the debt remains unpaid after the due date, Financial Services will contact the Office of Research to engage assistance with the debt collection process. If the debt remains unpaid after 90days and there are no exceptional circumstances, the debt will be placed in the hands of the University s debt collection agency Refunds Overpayment of debtors accounts originating from a credit card transaction made directly to the University will be refunded back to the originating credit card. Overpayment of debtor accounts or credit balances on debtor accounts will be refunded to the Account holder, or on written authority from the Account holder, to a third party. Approval to refund credit balances on Debtor Accounts will be given by the appropriate Financial Delegate listed in the Finance Management Practice Manual. The Payment Request will be supported by documentation indicating the amount of the credit and the original method of payment. Account holders may in writing authorise the University to internally transfer excess funds between the various USQ Account types. 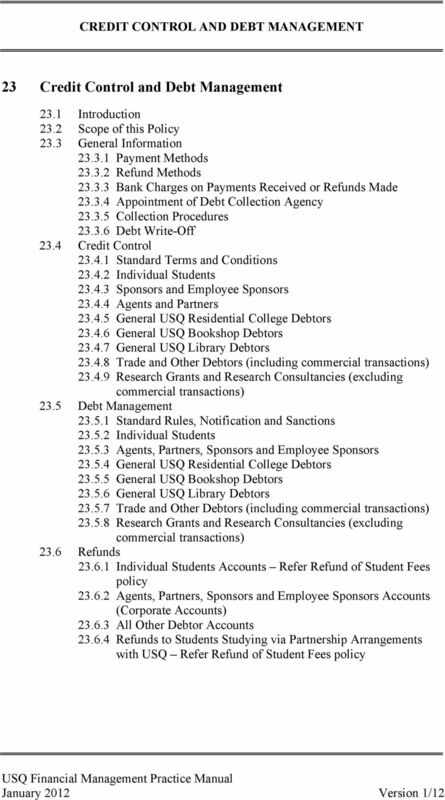 20 The University reserves the right to offset credit balances in one debtor account against a debit balance in another account held in the same Account name Individual Students Accounts Refer Refund of Student Fees policy Agents, Partners, Sponsors and Employee Sponsors Accounts (Corporate Accounts) Credit balances will be retained on Corporate Accounts at the end of each semester and will be offset against the debts due in a future semester. On written application from the Account holder the credit balance may be refunded. 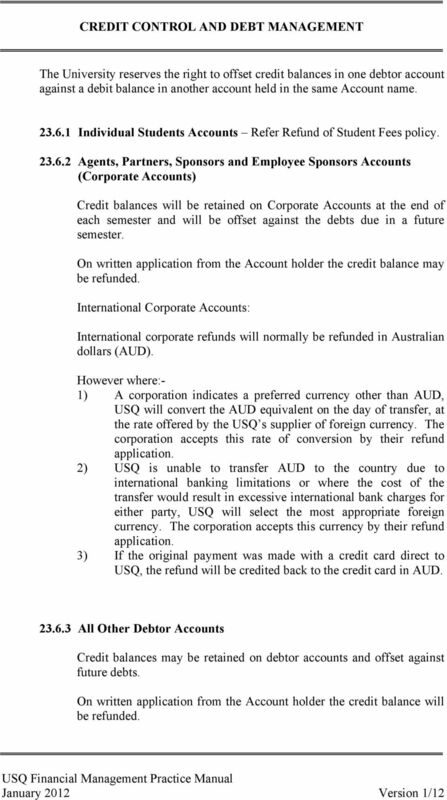 International Corporate Accounts: International corporate refunds will normally be refunded in Australian dollars (AUD). However where:- 1) A corporation indicates a preferred currency other than AUD, USQ will convert the AUD equivalent on the day of transfer, at the rate offered by the USQ s supplier of foreign currency. The corporation accepts this rate of conversion by their refund application. 2) USQ is unable to transfer AUD to the country due to international banking limitations or where the cost of the transfer would result in excessive international bank charges for either party, USQ will select the most appropriate foreign currency. The corporation accepts this currency by their refund application. 3) If the original payment was made with a credit card direct to USQ, the refund will be credited back to the credit card in AUD All Other Debtor Accounts Credit balances may be retained on debtor accounts and offset against future debts. On written application from the Account holder the credit balance will be refunded. 21 Where the refund is made by International Bank Draft or International Bank Transfer in a currency other than Australian dollars (AUD):- However where:- 1) The debtor indicates a preferred currency other than AUD, USQ will convert the AUD equivalent on the day of transfer, at the rate offered by the USQ s supplier of foreign currency. The debtor accepts this rate of conversion by their refund application. 2) USQ is unable to transfer AUD to the country due to international banking limitations or where the cost of the transfer would result in excessive international bank charges for either party, USQ will select the most appropriate foreign currency. The debtor accepts this currency by their refund application 3) If the original payment was made with a credit card direct to USQ, the refund will be credited back to the credit card in AUD Refunds to Students Studying via Partnership Arrangements with USQ Refer Refund of Student Fees policy. 1.7 Department of Treasury and Finance. 5.1 This instruction applies to all public authorities unless otherwise stated. This document must be read in conjunction with your account terms and conditions, fees and charges and interest rates booklets.